Ecosphere Technologies, Inc. has over 10 years of experience in treating some of the world’s most contaminated waters without the use of harmful chemicals. Our patented, Ozonix® Technology allows us to help industrial manufacturers maximize asset value protection and mitigate risk, meet or exceed ever increasing industrial wastewater regulations, and decrease dependency on liquid chemicals. The automotive manufacturing process is fueled by water. Although baths, rinses, and cooling are the most common applications, clean water is critical throughout the process. Regardless of the stage, there are significant water demands and resulting effluents. Ecosphere’s clean water Ozonix® technology is a proven, chemical-free alternative for the cost-effective treatment, recycling and reuse of manufacturing waste and rinse waters. Water plays a critical role in every step of the pharmaceutical manufacturing life cycle. Ecosphere Technologies is committed to providing chemical-free process water treatment technologies to address a broad range of industry specific water challenges, from water disinfection to oxidation of contaminants. Regardless of scope or application, Ecosphere can help pharmaceutical companies and local municipalities deal with their pharmaceutical wastewater treatment challenges and meet both financial and environmental obligations. Pulp and paper is one of the worlds most water dependent industries, with water involved at nearly every step of the process. 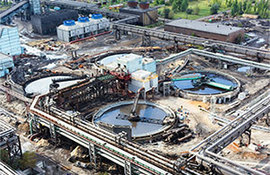 Large quantities of wastewater are produced creating ongoing treatment and discharge challenges. Ecosphere is the global leader in onsite, chemical-free wastewater treatment solutions for high volume industries, and can help pulp and paper operations remove their dependency on toxic chemicals, enhance productivity, and reduce operational costs. As in many industries, the textile industry requires the consumption and discharge of a great deal of water. Effectively treating outflow and identifying opportunities for water recycling and reuse are critical to ensuring a competitive edge in a tightly contested global market and adherence to environmental regulations. As certain discharge - particularly dyed wastewater - can be difficult to treat, the industry has long resorted to chemical solutions, which can be costly and dangerous. There is now a proven alternative. Ecosphere’s patented Ozonix® Technology offers textile manufacturers a chemical-free option for high-volume water and wastewater treatment and water reuse and recycling. Water parks and leisure destinations with water-based attractions can require the daily processing of millions of gallons of water. Calcium fouling is one of the primary threats and can cripple systems and drive up costs. In addition, municipal regulations must be adhered to in order to protect the health of guests and the surrounding environment. Ecosphere’s patented Ozonix® Technology offers customers a chemical-free alternative for high-volume water treatment and recycling, enabling leisure and park operations to reduce operation costs while protecting guests and the environment. Process water is used in any number of manufacturing processes, from cooling to boiler water and cooling tower make-up, to rinsing and washing. The water treatment needs are as varied as the water uses. For instance, effective pre-treatment of process water boosts product quality, while pre-treatment of boiler feed water can reduce overall fuel consumption. In addition, wastewater treatment, reuse, and recycling are critical to controlling costs and meeting environmental regulations. Ecosphere’s patented Ozonix® Technology provides manufacturers across industries with a proven, chemical-free alternative for the pre-treatment of process water as well for cost-effective wastewater treatment and water recycling. The microelectronics industry is booming. As miniaturization technology advances, so do industry requirements for water quality. Water is principally leveraged as a rinsing agent and purity levels must be high or the quality of product can suffer. In addition, a great deal of effluent discharge is produced which is subject to ever more stringent environmental regulations. Ecosphere’s portfolio of patented, green technologies can help microelectronics manufacturers improve both their bottom line and environmental footprint, by providing proven chemical-free alternatives for water disinfection and sterilization to ensure purity levels, water reuse and recycling to reduce overall water consumption, and effective wastewater treatment. Waste management operations and regulations vary from region to region, but the premise is the same; operators must collect, transport, process, and recycle or dispose of all manner of waste product and ensure that these efforts in no way adversely effect human populations or the environment. Enter Ecosphere. Our proven portfolio of chemical-free, green technologies can be employed by waste management operators to address a broad range of water management challenges. From wastewater treatment to odor control, Ecosphere represents an environmentally responsible way of reducing operational costs and reliance on chemicals, while meeting or exceeding stringent regulations. Become a licensed technology provider to industrial manufacturers.